Well, I made it through March and all the nonsense of packing and moving everything… and totally made the wrong book choice during that stupid-busy insanity. It took me almost a full month to read Atonement. Boo! 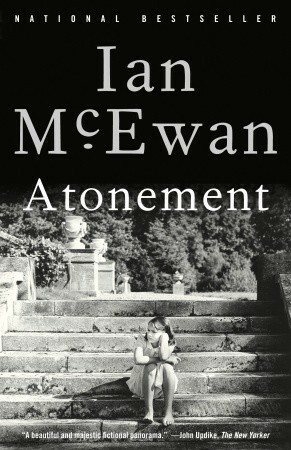 Atonement by Ian McEwan is a historical fiction surrounding one misunderstood event and the devastating consequences that followed. In 1935 precocious and self-absorbed 13-year-old Briony Tallis, youngest child of an aristocratic British family, witnesses a private flirtation between her older sister Cecelia and Robbie Turner, son of one of the family’s employees. Briony misconstrues this adult act and accuses Robbie of something that sends him to prison and effects the course of the family’s life for decades after. Atonement is another book I’ve had on my shelves for years, bought with the best intentions long ago but never cracked… perfect for my 2013 TBR Pile Challenge! Unfortunately, I picked the absolute worst month to try to read this. Atonement, for me, was extremely slow to start and hard to get into. Nearly all the action in Part I (and much of Parts II and III) is internal and a good amount angsty. It was hard for me to feel any forward motion for much of Part I, and it took around 130 pages to finally pick up the pace and grab me, but sadly with lots of chaos and little time that comes with moving, it was tough to stay invested and intrigued by the story. I hate to say it but f this hadn’t been on my TBR (because I really want to complete this challenge) I would have probably put it down within the first 60 pages. Of course, that’s not to say it is a bad book. The prose is superb (if quite dense). Every sentence is purposeful and lyrical, and McEwan paints a vivid landscape in which his characters exist. I will admit I pushed through to the end not only because of the TBR challenge, but also because of all the hype; I had to find out if the ending was really worth it as much as I had heard/read it is… while I wasn’t completely blown away, overall I’d say yes, it is worth it, although not in the way I expected (which is probably good, I guess!). No spoilers here, but I am still thinking about the ending days after I finished. Pretty crafty, McEwan! So that is saying something, and I really did like the parts taking place during the war (Robbie as soldier, Briony as nurse). Still, I’m not certain if my lack of connection with the characters and trouble investing in the story were symptoms of what was happening in my life when I tried to read Atonement or just how I would have felt about it anyway if I had read it under normal circumstances. Atonement was my fourth read of twelve books total for the 2013 TBR Pile Challenge, hosted by Adam at Roof Beam Reader. Read from March 9 to April 7, 2013. This entry was posted in books and tagged 2013 tbr pile challenge, drama, family, female adolescence, fiction, history, literature, love, military, war, writing by kristin @ my little heart melodies. Bookmark the permalink. I haven’t read this one. I love it when a book lingers with me for days after I’ve finished it. I would recommend it. I do believe a good part of my sort of ambivalent opinion has to do with reading it during a particularly stressful and busy time. But yes I agree, even with a book I don’t feel crazy-in-love about, it means something when you’re still thinking about it days later! I’ve had this one on my shelf for years, too. I bought it when it first came out, as it was getting great reviews. But, I’m just not sure that it’s for me. I’ve only read one book by Ian McEwan (The Cement Garden – which I loved), so I do want to give him another try sometime. I tried watching the movie adaptation of this one, too, but couldn’t get into that, either. Congrats on being on track with the challenge! Thanks! I kind of can’t believe I’m still on track after having to move mid-semester. Good thing I had time early in the year to read ahead a bit 🙂 I have gotten high recommendation for McEwan’s latest, Sweet Tooth. I might check it out one day because I did enjoy his prose in Atonement, but because of the slow nature of the story I have to say it’s not a priority. Gotta get through the rest of my challenge books, first! Oh and I might try the movie eventually too, it’s sitting on my Netflix queue. I haven’t read the book, but the movie is fabulous. I wrote a paper about the music from it for Granade’s film class, so I have watched it many, many times. Yeah, quite possibly. Obviously it affected me, but maybe not really enough for a re-read… but who knows. Maybe one day.